Gloucestershire has been selected to be one of only 14 Integrated Care Systems (ICS) across the country. This means that health and social care services will be working even more closely together to support people to keep healthy and independent, develop care and services in people’s own homes and communities and ensure high quality, safe hospital services are there when needed. The announcement is in recognition of Gloucestershire’s strong leadership, effective partnership working and ambitious plans to join up support and services as well as improvements in A&E performance, cancer treatment times and access to GP services. We’ve also seen a reduction in cancelled operations and delays for people ready to leave hospital. Being an ICS will bring benefits to the county, including greater freedom and control over local decisions about how money is spent and how services are developed, as well as a greater ability to attract additional money to the county to develop services for the future. Going forward, we will continue to draw on the expertise of others, such as councils, charities and the wider voluntary and community sector, to ensure the needs of local people are met. More than £1.2m has been pledged by the CCG and other partners to help get 30,000 inactive people in the county doing daily exercise. Gloucestershire Moves is an exciting project which aims to create a sustained culture of physical activity through a number of motivating schemes, such as encouraging people to take up healthier ways to travel. An innovative scheme called ‘Beat the Street’ got underway in Gloucester in June and is proving to be hugely popular. It uses electronic tap boxes on lampposts to encourage people to walk and cycle around the city, with fun challenges and leader boards to add an element of competition. Within the first three weeks, more than 9,600 people signed up and covered in excess of 43,000 miles between them, meaning that the competition has already met its target of engaging 9,000-12,000 participants. The competition closes on 19 July 2018. More than 21,600 pupils from at least 120 schools are now walking, jogging or running their way to better health thanks to the huge take up of the Daily Mile in Gloucestershire. A partnership between the CCG, Active Gloucestershire, the County Council and local schools, the initiative got underway in March 2017 and its success keeps marching on. An extra 11,121 pupils and 63 schools jumped on board in 2017/18. Being physically active at a young age not only leads to a range of health benefits, but has also shown to improve academic performance. Teachers are reporting that children concentrate better in class and come back from their Daily Mile refreshed and ready to learn. Parents comment that their children are eating and sleeping better. Nearly 2,000 Gloucestershire people are being given a new lease of life thanks to a free diabetes prevention programme. The scheme targets individuals who have been identified by their GP surgery as having high blood sugar levels, which puts them at significant risk of developing Type 2 diabetes. Sessions cover nutrition, exercise and suggested behavioural changes to maintain a healthy weight and become more physically active. Just a few simple lifestyle changes can prevent or delay the onset of the disease. So far, the programme has been introduced in Gloucester, Cheltenham and the Forest of Dean and plans are in place to extend it across the county later this year. If you receive a letter from your GP surgery, please take action – it could make a big difference to your health. People in Gloucester and the Forest of Dean who live with a long-term condition can now join the new Live Better to Feel Better programme, where they can learn useful skills to help build confidence and improve their health. The programme offers participants an opportunity to meet others in a similar situation and talk about some of the common challenges they face and ways to manage their condition. They can learn how to use simple techniques such as controlled breathing and other relaxation approaches to help them sleep better or manage a low mood. There is also advice about how to get the best from the professional support that is available. The programme is free, and is provided by Gloucestershire Care Services NHS Trust. It takes place over five sessions run by skilled staff and trained volunteers who really understand the challenges and feelings involved as they have long-term conditions themselves. It will be available across the county from September this year. It is anticipated around 400 people will join the programme in 2018/19. With time, most muscular and joint aches and pains will get better by themselves and there is no need for people to visit their GP. To help people feel more confident about managing their ailments themselves, we are making it easier to access good quality online information on local NHS websites with useful tips and advice on how to manage common ailments such as back, knee, shoulder or hip pain. Anyone who needs additional support can refer themselves to physiotherapy services, again without going via a GP. Physiotherapists offer specialist assessment and treatment for a wide range of problems and work with people to help them help themselves. For advice and information about how to refer yourself to physiotherapy services, visit gloshospitals.nhs.uk/physio or glos-care.nhs.uk/physio. GP practices across Gloucestershire have continued to embrace new ways of working to ensure the needs of patients can be met well into the future. They have grouped themselves into 16 GP ‘clusters’ so they can work more closely together, be more resilient and provide a wider range of services in their communities. In many areas, other health professionals are working in GP surgeries, providing expert support and freeing up GP time. This includes paramedics, physiotherapists, mental health staff and more than 40 clinical pharmacists. Signs are that this is making a real difference in surgeries with GP time being freed up to spend with patients who have chronic long term health conditions. Joined up Health and Social Care Community Teams are working closely with GP practices to support people in their own homes, helping them to return home sooner after operations and treatment or avoid a hospital stay. The Integrated Community Teams (ICTs), which are run by Gloucestershire Care Services NHS Trust, received more than 65,000 referrals in 12 months and are available seven days a week. The ICTs look for better ways to help people achieve the best possible outcomes, whilst reducing unnecessary hospital stays. This year, there have also been over 2,000 monthly patient contacts with the community rapid response service, which provides a response at home or in the community within an hour. Winter inevitably puts already busy NHS services under even greater pressure. However, this year, unprecedented partnership working and an immense effort from frontline NHS and social care staff led to significant improvements in service performance. In the seven months from June 2017, the county’s two emergency departments were amongst the strongest in the region for meeting the national maximum four hour waiting time standard whilst performance over the four winter months to the end of February 2018 stood at 91.1% compared to 78.2% for the same period last year. There were significantly fewer cancelled operations and delays for patients fit to leave hospital and a large reduction in ambulances waiting more than 30 minutes to transfer patients into hospital. Pregnant women and new mums in Gloucestershire will benefit from over £113k funding which will improve specialist community mental health support for women, their babies and families. Gloucestershire was one of only 20 areas to be successful in receiving wave one funding last year. This was used to set up a specialist perinatal mental health team which supports pregnant women and new mothers who are experiencing post-natal depression and other emotional difficulties, as well as their babies and families. The service has been really successful since it started in July 2017, and has already received nearly 150 referrals. The additional funding will give the service a welcome boost and will be used to expand and develop the team. With one in ten women experiencing a mental health problem during their pregnancy and in the first year after birth, providing high quality support to new mothers, newborns and their families is important, and is a high priority in Gloucestershire. Partnership working in mental health is crucial in preventing people becoming unwell, providing early support and advice and high quality care when needed. An additional £825k has been spent on the psychological therapy service Let’s Talk to help people experiencing common conditions such as stress, anxiety and depression. This year alone, Let’s Talk helped more than 7,000 people access support. A further £113k is boosting the £1.5m national funding Gloucestershire received last year to improve specialist community mental health support for pregnant women and new mums, meaning that the service can be expanded to support even more people. Other developments include the opening of a wellbeing house in partnership with national charity Mind and funding extended hours at The Cavern in Gloucester, where people can benefit from non-clinical support, company and a listening ear. There have also been new investments in mental health crisis services, criminal justice liaison services and mental health work within local hospitals. Great strides have also been made this year to improve mental health provision for children and young people. Early advice and help has been a feature of developments this year with the involvement of young people, parents, carers and professionals key to their success. So far, 19 schools have been accredited as part of the Mental Health champions Award scheme whilst the ‘On your Mind’ website, which is designed to help young people cope with life’s ups and downs, had 10,000 visitors in its first 12 months. More than 900 people were seen this year by Teens in Crisis which provides online and face to face counselling for young people aged 9 to 21. Of those receiving this support, 88% said they had been helped a lot or totally. The NHS in Gloucestershire has been working hard to reduce cancer waiting times and improve support for patients; more people with suspected cancer are now being seen within two weeks and if diagnosed, starting their treatment within 31 days. Working with partners, we have introduced new GP guidance and patient information to improve arrangements for referral to hospital and we are continuing with an extensive Macmillan GP Masterclass programme to support the early recognition of suspected cancer. We are also working hard to ensure patients receive faster and more joined-up care through combined clinics; patients can now see a urology specialist and have tests in a single visit whilst people with some skin cancers can be diagnosed and treated on the same day. When a GP suspects bowel or lung cancer, more patients now go straight for a diagnostic test, such as a colonoscopy or CT scan. Gloucestershire is also gaining national recognition for its Macmillan Next Steps Cancer Rehabilitation service. This specialist community service for people with breast, colorectal or prostate cancer is provided by Gloucestershire Care Services NHS Trust. It helps people with their recovery, and lifestyle advice to improve and sustain their wellbeing. More people in Gloucestershire are surviving sepsis thanks to improvements in diagnosing and treating the condition. Also known as blood poisoning, sepsis is caused by infections such as pneumonia or gut problems. It can be very serious and is often hard to spot, but can be treated easily if it is detected early. Clinicians in Gloucestershire have been raising awareness of sepsis across a range of non-hospital health settings such as care homes and GP surgeries to help ensure that it gets recognised and diagnosed promptly. To help with this, GPs and other healthcare professionals are now using a calculator called NEWS (National Early Warning Score) which helps with diagnosis. Meanwhile, our two main hospitals have been highlighted by NHS England as being amongst the most improved and in the top 10% of Trusts in England for identifying and treating sepsis. Thanks to these initiatives, the county won the Nursing Times Patient Safety Award and was asked to share its approach with NHS England to help other organisations. 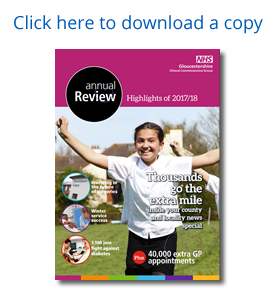 The West of England region, which includes Gloucestershire, also won the 2018 BMJ Award for Patient Safety.